Cosmetic surgery is dominating the fashion trend due to the inclination of the millennial for the perfect look. The current generation is under a lot of pressure to have appealing looks in society. Hence, the primary quest for the best skin beauty clinic is just a click away due to the prominence of the internet at every home. This theme is apt for Beauty, Spa, Salon, Barbershop, Massage, Make-up, Cosmetic Surgery and Yoga due to its friendly retina ready interface. It is WPML plugin compatible allows multilingual website. It has custom product layouts of WooCoommerce, full screen sliders, landing page theme and many more. 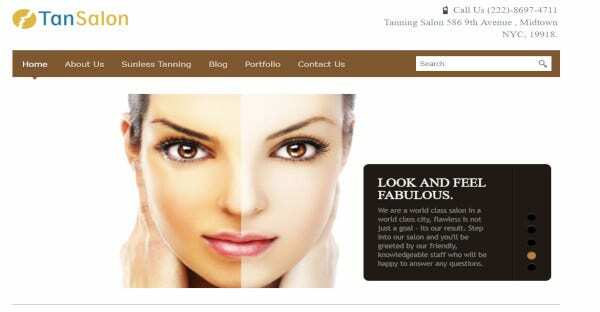 It offers a fully responsive theme to attract customers looking for tanning salons in any device. It provides a plethora of SEO options to be found easily by any customer browsing through the internet. It also supports many widgets to enhance the utility of your site. It contains some features like widget ready, cross browser friendly, many custom colors and communal integration buttons. With a powerful admin interface, it provides a chic theme for make-up, cosmetics and beauty lifestyle. The theme is highly customized. It has no pre-requisite of coding knowledge. It supports WooCommerce plugin for online bookings and reservations and Visual Composer Page Builder for easy page making. 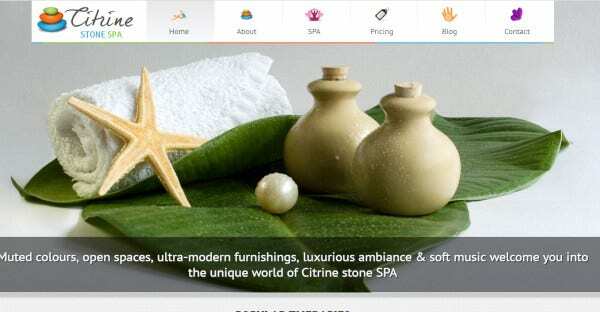 You can create your ideal website highlighting various ayurvedic cures, massage therapy, wellness treatment, beauty hacks, nail art, pedicure, and manicure. You can showcase your gallery of styling for special occasions in a customizable grid with easy drag and drop utility. It provides a list of well-designed modules to build your website. 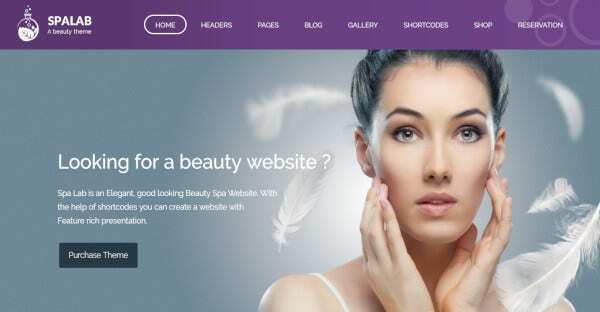 This theme is well suited for your online business on beauty, spa, salon or massage. It includes many demos for any beginner in this business. It includes Visual Composer Page Builder and WP Customizer for a simple and attractive interface. It is retina ready, SEO ready, multi-language theme. 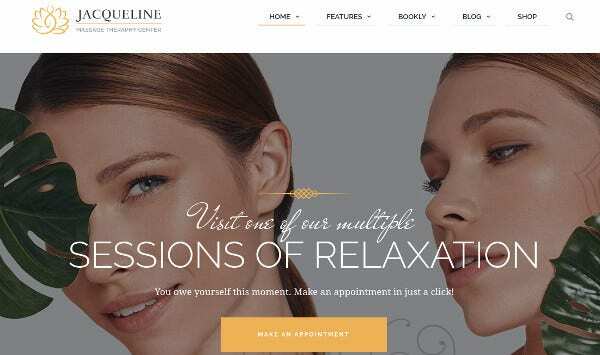 It is the best WordPress theme available to design your website for an online business in salon, beauty, and facial hair treatment. 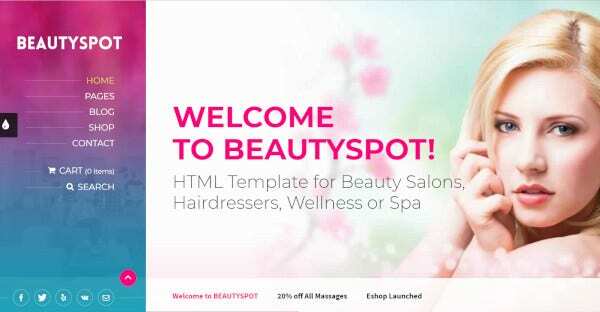 The theme is easy to install and usable for hairdressers, beauty parlors, hair parlors, men’s salon, any hair care manufactured goods companies and many more. 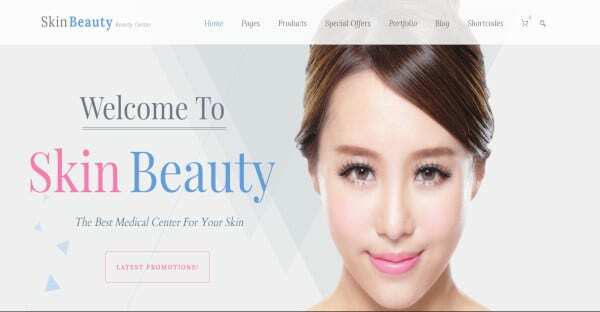 It’s an exotic Health and Beauty WordPress Theme for beauty and skin therapy, massage, spa, and hair care. It facilitates fixing appointments for spa and massage. It also allows the selling of spa products and creams due to the WooCommerce plugin. It provides an eye-catching catalog of products and their specifications in a blog layout. You can choose the perfect grid for icons on your homepage or full-width content to create an impressive interface. It supports the latest WordPress version 4.7+ and has nice blog portfolio, different types of layouts, different color schemes, and retina ready icons. It presents the full-width social media bar at the bottom. It’s a simple, trendy and clean theme ideally suited for wellness center, hair salons, meditation / yoga classes and any healthcare businesses. This WordPress theme has the advantage of predesigned pages which makes it a better option over others. It is built using Elementor Page Builder to design pages easily. 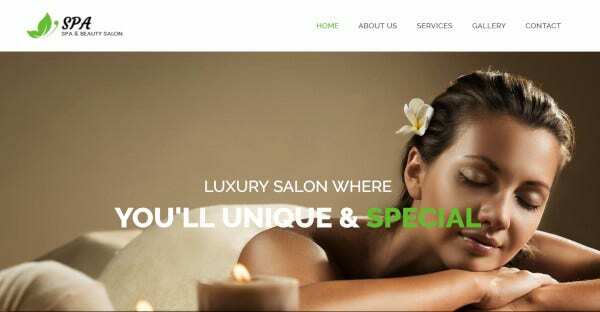 It’s a modern, gorgeous and fully responsive theme that attracts clients for beauty clinic, spa, massage, salon, hair care, and health wellness. It provides full documentation with every layout to aid in designing. It’s compatible with every type of device with its retina ready interface. It has sticky header, widgetized sidebar, logo options, nice moving sliders and compatible with any major browsers. You can design a webpage with different icons to highlight on different professional utility. The icons are retina ready and lively layout to seem appealing to customers. It contains 40+ predesigned beauty, massage and spa pages. It supports WooCommerce online bookings for any organic skin products. You have the ease of setting up your website all by yourself in a short span of three days. 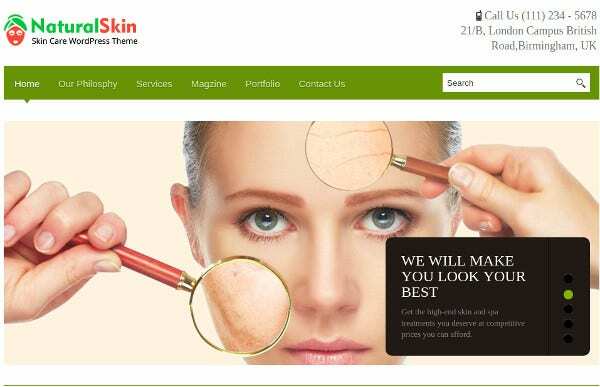 It doesn’t require any coding skills to create your site to showcase your online beauty skin clinic. You have the facility of easy customization due to drag and drop editor. This WordPress theme is crafted for wellness centre, hair salons, meditation / yoga classes and any other health care related businesses. It includes some important advanced features like reservation, therapists, gift card, menu card designs, product and many more. Its fully responsive and flexible WordPress Theme. It is an upscale, convenient, and professional WordPress theme. You can use an array of frames to adorn your homepage. It can be accessed through any device conveniently. It has advanced and latest options to customize your page. It contains image options for background, testimonials section, different social icons and many more. This custom and responsive theme is built by CSS3 & HTML5. It has enhanced some incredible features of portraying tempting icons to your clients. It is highly documented for your convenience. It is compatible with the Elementor Page Builder to create a highly functional interface and best for foot massage services. 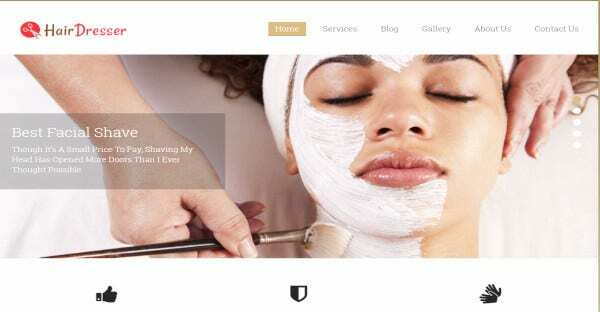 It’s a gorgeous modern and fully responsive WordPress Theme for beauty and spa. 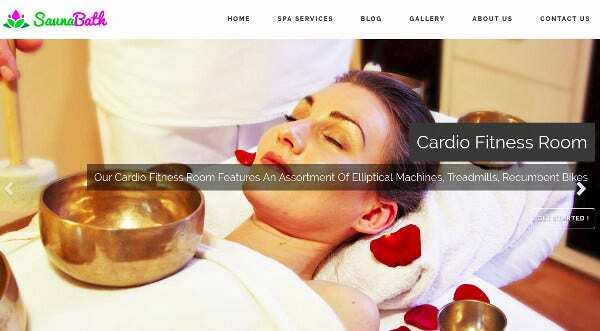 This well designed theme is best for spas, barber shops, hair salons, wellness centers, fitness classes, yoga classes, and any healthcare business. It is furnished with accurate documentation for you to develop your website conveniently. It provides an amazingly easy interface to design your website without any coding or design skills with drag and drop editor. It’s a highly responsive, easily customizable home page, and SEO friendly theme. It contains browser compatibility, support 3rd party plugin, detailed documentation and drags & drop facilities. It is a highly responsive theme compatible with all types of devices. It provides predefined demos to help you in starting your venture. 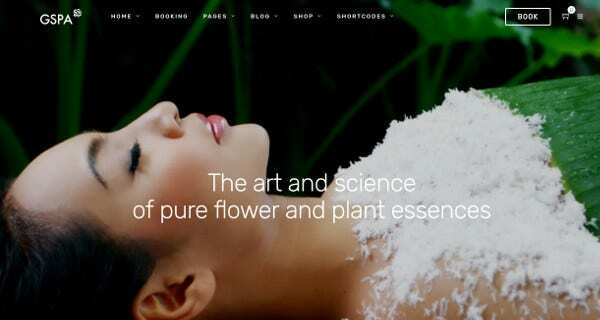 The theme is suitable for spa, beauty, and salon industry websites. It has easy drop down menu and codes elements. This theme can flawlessly present beauty business online with highly functional designs. The theme has best plugins that help you to add various custom blocks to your website. A large grid of flexible widgets adds more functional modules to your site. It’s a dominant theme to support your online beauty business. It has four blog layouts. 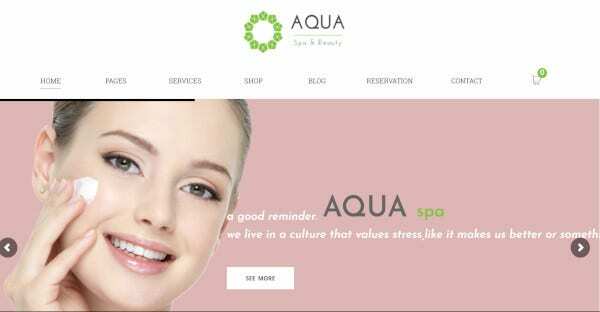 It is a premium spa and beauty WordPress theme which is ideal for beauty styling, spa, and massage. It provides a large number of images to adorn your homepage and present it as a catalog for any fashion enthusiast. The theme is completely responsive and has awesome sliders. 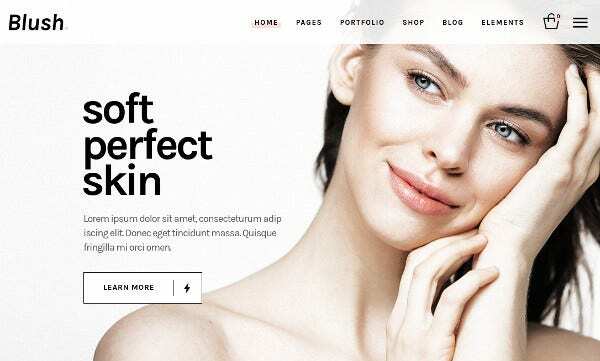 Hence any fashion enthusiast embarking on an online skin beauty clinic can use any of the above WordPress Themes to run your business successfully by attracting the online crowd to sell your beauty products or to book for your appointment. The perfect theme is to be selected for your hair styling, spa, massage, skin care or health-wellness.